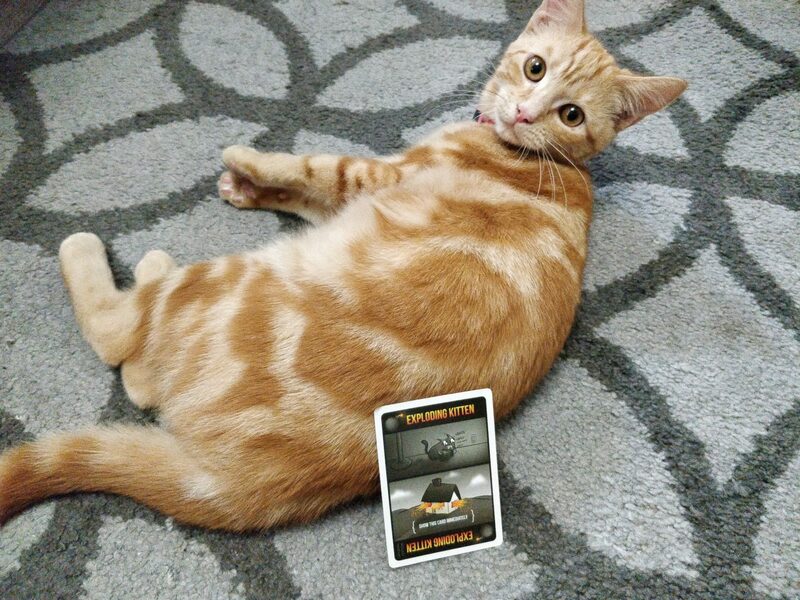 Exploding Kittens, as the name would suggest, is a card game about exploding kittens. 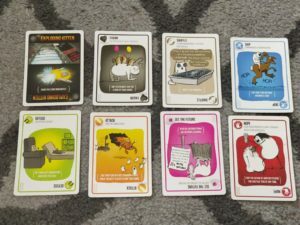 Or, to give it it’s full description it is “A card game for people who are into kittens and explosions and laser beams and sometimes goats.” We’re big fans of all of those so were more than happy to review it! The game is easy to set up and the instructions also reference a YouTube video with the instructions and set up guides (see below). 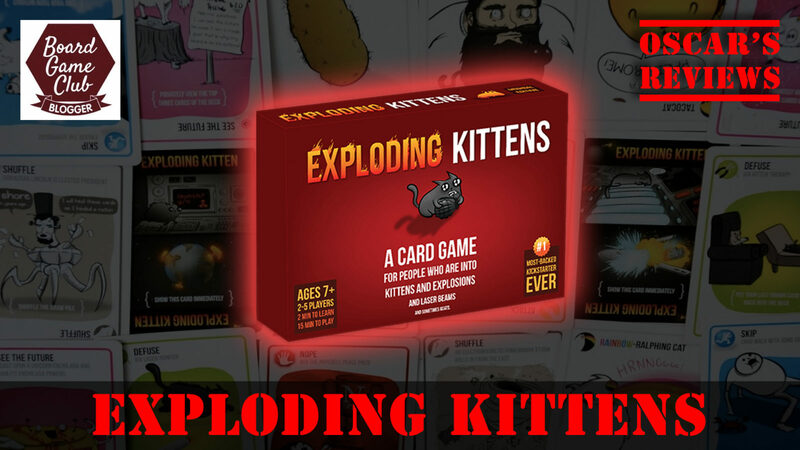 In a nutshell, Exploding Kittens is a mixture between the classic card game Old Maid and Russian Roulette – there’s a ‘bad’ card that you don’t want to be left with at the end; that card being an exploding kitten that you’re unable to diffuse. If you explode then you lose, if you don’t explode then you win. Simple! The set-up is as simple as the premise and varies slightly depending how many players there are as you have to make sure there are enough exploding kittens to ensure only one player can win – i.e. a four player game would have three kittens in the deck. You remove all the exploding kittens and all the diffuse cards from the pack and deal a single diffuse to each player. The remaining cards are then dealt out to give every player a hand of 5 cards and then the kittens are shuffled into the deck. The first player places any of their cards face up on the table and carries out the instructions on the card. They can then choose to place more cards down or end their turn by picking a new card from the deck. You can also just choose to pick up a card to end your turn without playing one first. If you pick up an exploding kitten then you die… unless you have a diffuse card to stop it from exploding. Playing a diffuse card stops the kitten exploding but then that player must place the kitten anywhere back in the deck – and this is the fun part, they can do it however they want to and without anyone seeing. It could be put back on the top for the next player to pick up, or they can count a set number of cards to try and target a specific player or they can place it randomly. You would continue to play using these cards to defend yourself so if the player before you diffused a kitten and you suspected they placed it at the top of the deck you could use a ‘See the Future’ card to check if you were safe – if your suspicions were correct then you could play a ‘Shuffle’ card (if you have one) to mix them up so you don’t explode on your turn – that is, unless someone stops you with a Nope card. After picking up a card to end your turn the play would continue with the next player. As you near the end of the game and realise there are no more diffuse cards you start to hope you have enough other cards to keep the exploding kitten away – but that’s not always possible and it can get very nerve-wracking/exciting working out how to stop the other player from attacking you or from trying to make them waste their cards. Game time is around 15 minutes and you always have a winner – decided through a mixture of skill, ruthlessness and simple luck-of-the-draw. It actually sounds more complex than it is but it’s one of those games that makes more sense when you actually play it. 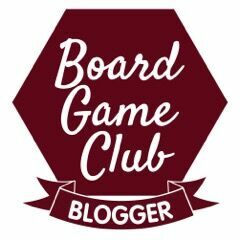 We’ve taught a number of people from age 6 to adults how to play the game and none have struggled (the game’s target audience is age 7+). The game can be played with 2 to 5 players and unlike some games, the 2-player version is exactly the same and doesn’t require any changes to be made to the gameplay. The pictures on the card are funny and weird but really add to the overall feeling of Exploding Kittens. For example it’s not simply a ‘Diffuse’ card, the text on each is different e.g. “Diffuse via participation in kitten yoga” with a matching image of a fat, hairy bloke doing yoga alongside a kitten. One of the ‘Shuffle’ cards says “A plague of bat farts descend from the sky” with a matching image. 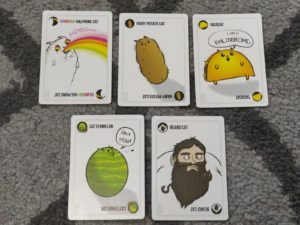 Overall, Exploding Kittens gets a massive thumbs up from us due to its simplicity, faultless instructions, amazing artwork and it’s just fun to play for all ages! It’s also very silly. An Imploding Kittens expansion pack is also available which adds new cards to the deck as well as a new way to die. 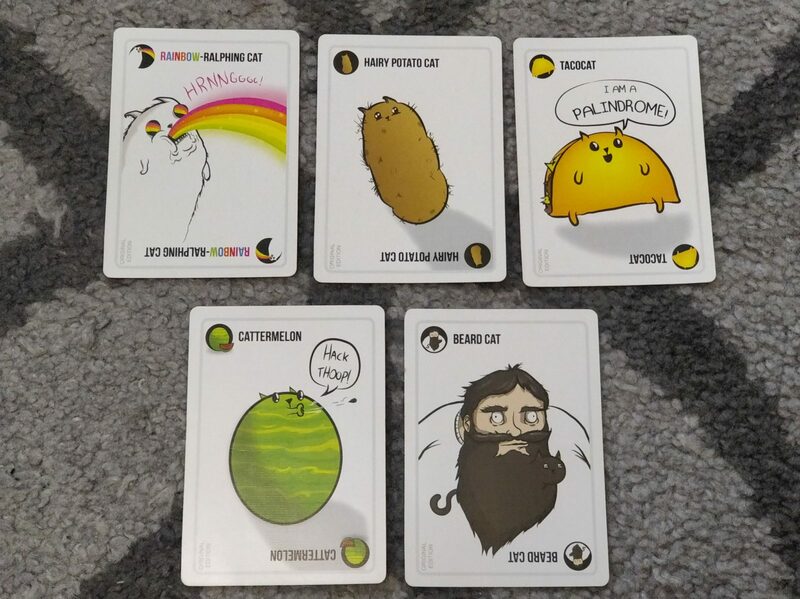 There is also an Exploding Kittens: Party Pack which is a separate set with the extra cards from the Imploding Kittens add-on along with enough kittens and diffuses for up to 10 players.